You thought sending a Tesla was the only thing SpaceX was gonna waste time and money on, well, you were wrong. 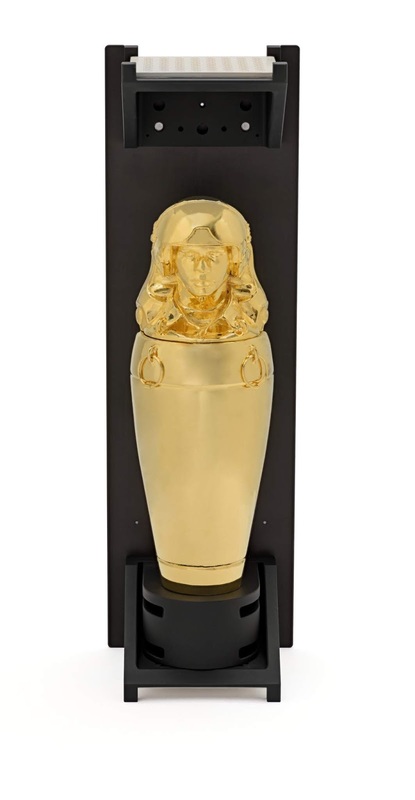 In the "I guess that's neat" category of art meeting science we're sending a 24-karat gold canopic jar into space. If you know your basic Egyptian history from watching Brenda Frasier's The Mummy you might remember that canopic jars hold the organs of the recently mummified. This is gonna take a sec to explain, so relax and read. 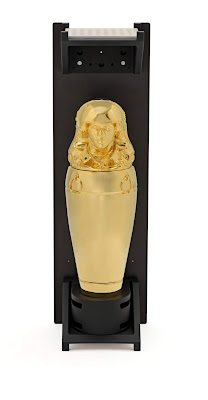 Titled "Enoch", the canopic jar comes from artist Tavares Strachan in memory of the first African American astronaut, Robert Henry Lawrence Jr., selected for our national space program. From what we read, he never actually made it into space, but was very helpful to getting us there. The canopic jar has a bust of Robert Henry Lawrence Jr. on it and for some reason the artist had it blessed at Japanese Shinto Shrine. To clarify, it does not contain any of Robert Henry Lawrence Jr. organs. It was funded by the LACMA Art + Technology Lab grant, so taxpayer money probably didn't pay for it. It is suppose to be launched Monday, Nov 19 as one of the items going up on a Space X rocket. If all goes to plan it will circle the Earth for seven years. Weird.